According to the Department of the Environment, we’re awash in plastic bags — something like 50 million a year. Most of them are not recyclable. Most of them are collected from garbage cans or city streets and dumped. As the ad says, plastic is forever. We’re already paying taxes so that we can clog our landfill with materials that will not degrade, when we might well use the money for more constructive purposes. And, Paul Goettlich points out in a Chronicle op-ed, we’re already paying the supermarkets for the bags. Crazy San Francisco always makes for news, and so the media love the issue. But the general public is confused. San Francisco sunshine is a little dimmer these days. The Chronicle announced on Friday that Mayor Gavin Newsom has canceled Channel 26’s coverage of the Planning Commission and the Police Commission. The very under-publicized order (no press release on the mayor’s web page), issued on January 15, is designed to save the city $147,000. Why the Police Commission, inquiring minds might ask, and not the Taxi Commission, which is still going strong? In case you feel like attending, the Police Commission meets at 5:30 on Wednesdays (including this Wednesday, February 9) in Room 400, City Hall. The Planning Commission meets at 2:00 on Thursdays (including this Thursday, February 10) in Room 400, City Hall. Meanwhile, members of the School Board are continuing in their seemingly endless quest to bring more sunshine into the workings of the SFUSD. Channel 26 does not televise School Board meetings, although public radio station KALW (91.7 fm) broadcasts the proceedings. The School Board meets on the second and fourth Tuesday of the month (including today, February 8), at 7:00 in the Irving G. Breyer Board Meeting Room, 555 Franklin Street. The problem is that the city’s Sunshine Ordinance doesn’t cover the Board. In an effort to shed a little light on the subject, the Ad Hoc Committee of the Board of Education on an Open Government Policy for SFUSD — that’s Mark Sanchez, Chairman; Sarah Lipson; and Norman Yee — will meet on Thursday, February 10, 2005, at 5:30 p.m., in the Irving G. Breyer Board Meeting Room, 555 Franklin Street. School Board, Police, Planning. Forget about TV. The SFCall will be there. Tune in for further developments. 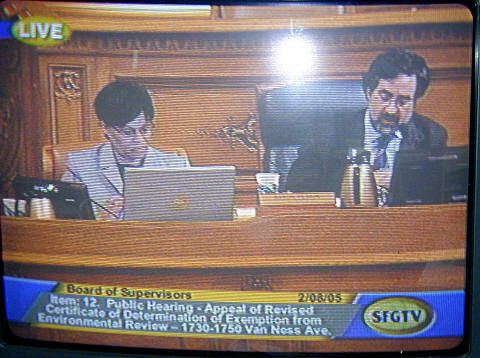 The Board of Supervisors is still getting air time. On the agenda for this afternoon is an “Appeal of Revised Certificate of Determination of Exemption from Environmental Review,” which means that a group of neighbors are trying to block the expansion of the American Buddhist Cultural Society building at 1730-1750 Van Ness. Missed it? You didn’t miss a thing. The hearing was continued until March 15. 1. The project is a not-so-cleverly disguised demolition and new construction and is NOT an alteration or “renovation”. No proper assessment of the project has been completed because of the fiction of the designation as an “alternation” the addition of a 50 foot, 18,000 square foot addition to a one story building dating from 1919. In truth the entire building will be demolished and the existing foundation (the developer revealed this component of the building is all that will remain AFTER the completion of the environmental evaluation) from 1919 can not hold a steel structure of 50 feet in height. The project must be reassessed as a replacement or reconstruction of the entire site. The project does not qualify for the exemption because it is the replacement of a commercial building in excess of 10,000 square feet and which will accommodate more than 30 people. The Department assessed different plans than those now being used as the new plans include a fifth story, a “pavilion” and much expanded outdoor area to be used for outdoor open burning ceremonies (which is a regular practice at the site). 2. The uses at the new site have not been properly revealed by the developer or evaluated by the Environmental Department. Although the project is increasing the building nearly four fold in its square footage and height, the developer informed the department that, “the number of workers and visitors on the project site would not change substantially.” The developer claims that a MAXIMUM of four monks will live at the site, a MAXIMUM of 8 to 11 visiting students will use the site for a MAXIMUM of four days and only one additional employee (may) be added, they currently have only one employee. The Temple service and congregation of 50-60 will not change. This described use is IMPOSSIBLE for the gigantic facility being constructed. If the use is as described, why is an auditorium with seats for 200 (which actually could accommodate twice that number) being constructed and dining facilities for 200-300 being constructed? Who will operate the industrial size kitchen? The environmental document claims there will be one employee who walks to work. Why are 25 bathrooms being added to the current three? This particular Buddhist Sect’s current operation in Los Angeles and elsewhere reveals a large industrial-commercial type operations of tourists, pilgrimages, and visitors. Proper assessment of bus zones, traffic, noise, air and water quality, public utility use, etc…can not be accomplished until the true use is described by the applicant. If bus loads of pilgrims are to be housed and feed at the site this use must be assessed. If the use at the site will essentially not change at all as described, then the size of the project should be dramatically scaled back to actually accommodate the uses as described.